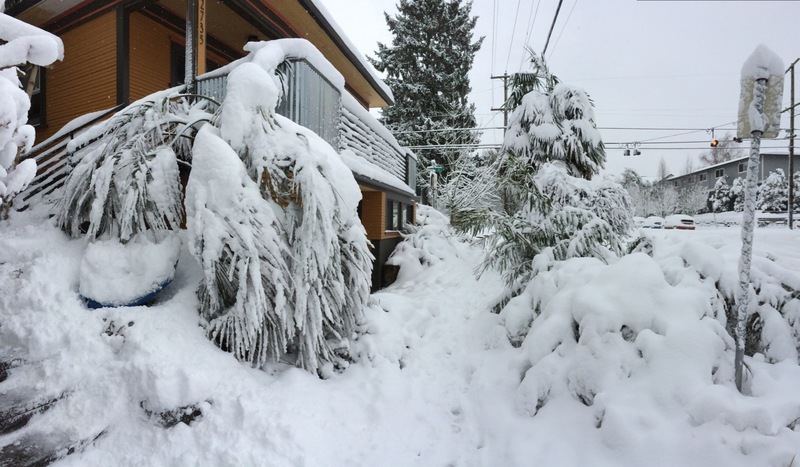 Published January 31, 2017 at 1280 × 747 in The Strength to Stand: Surviving the Load of Ice and Snow in Portland. An uncharacteristic heavy snow the morning after early in January of ’17 along the front of my house. To the left, splayed out and weighted down, is my Butia capitata. This one, from Argentina and not used to snow, had me worried, but it sprung back. The Oleander to the right, next to the sign, was bent down to the ground from its 8’+. Further back is one of my Chinese Windmill Palms, Trachycarpus fortuneii, bent under a snow load it is used to from high in the mountains of southern China.